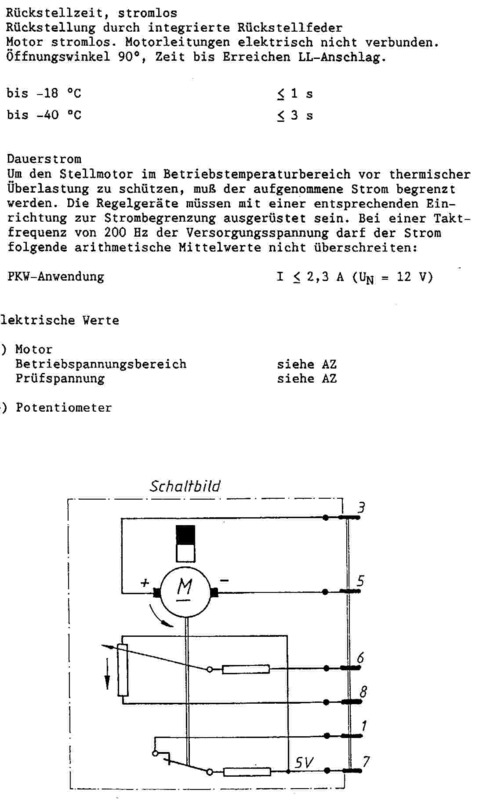 Jedes elektronische Steuergeraet ist mit bestimmten Festwerten, die aber nur Mittelwerte darstellen, programmiert. Das Steuergeraet erhaelt aber, je nach Einsatzbereich im Automobil, variable Eingangsinformationen, die permanent den gespeicherten Festwerten gegenueber gestellt werden. Das adaptive selbstlernende System vergleicht erst, ermittelt fuer den jeweiligen Fahrzustand den erforderlichen korrekten Wert, und leitet ihn an die betroffenen Fahzeugbauteile wie Luftmengenmesser, Drosselklappenstutzen, DME-Steuergeraet usw. weiter. Wird zum Beispiel ein EML-Steuergeraet fuer einen laengeren Zeitraum (ueber 1 Stunde) stromlos, dann verliert sein selbstlernendes System die gespeicherten Werte. Bei Wiederinbetriebnahme eines geloeschten oder bei Einbau eines neuen Steuergeraetes muss sich das selbstlernende System erst wieder zwischen den programmierten Festwerten und den variablen Arbeitspunkten einpendeln. Das kann zu anfaenglich unrundem Leerlaufverhalten oder Stoerungen der Schiebephase fuehren. Diese Massnahmen dienen zur sofortigen und exakten Synchronisation beider Zylinderbaenke in allen Betriebszustaenden. Von dort aus wird über einen Widerstand der Schalter "DK-Winkel>17°" auf Pin 1 geschaltet. Außerdem ist hier das eine Ende des DK Potis angeschlossen. Das andere Ende hängt auf Pin 8 und geht zu Pin 26/10 auf "Bauteilmasse (elektronische Masse)"
Alle Pins der DK gehen zum EML Steuergerät. Zwischen 6 und 8 können durchaus verschiedene Werte sein, je nach Stellung der DK selbst -> Prüfen. Zwischen 7 und 8 sollten die Werte IMHO gleich sein und zwischen 7 und 1 sollte man das Schalten des Stellungsschalters prüfen können. The EML computer controls the throttle-actuator motor based upon engine temperature, climate control, road speed, engine speed, braking input, ABS/ASC+T torque request, transmission shiftpoint directional current flow through the throttle motor winding opens or closes the throttle valve. During opening operation, the throttle motor is always working against closing pressure from the return spring. The mechanical closing force of the return spring provides failsafe operation in the event of a failure in the EML control system. The EML unit also employs sensors for feedback to monitor pedal position, throttle angle, and brake pedal activation. The EGS unit provides a low volt age signal to the EML unit whenever the "Sport" program switch is selected. The EML unit then adjusts throttle-opening curves to match the transmission's sporty shift characteristics. EML also plays a part in overall vehicle stability, by controlling maximum engine speed and vehicle speed. EML limits the engine speed to 6000 RPM by controlling maximum throttle-opening angles. Vehicle speed is also limited by closing the throttle valve before the maximum allowable speed is reached. The DME unit provides the TD signal for engine-speed limiting, while the instrument cluster provides the vehicle-speed signal. Note: depending upon the model year, the vehicle speed input may be provided either by the instrument cluster or the EKM (electronic body module). Using two current probes across each wire to the idle motor shows a 1 msec current pulse through the DK valve at 5 amps peak. The current probe is set to lOmV/per amp, and each pulse shows a maximum of 50mV. Two current pulses are visible because current flow in a series circuit is the same amount through all parts of the circuit. The "on time" of this 5 amp pulse determines the opening force of the throttle valve. A gear reduction unit allows precise movement of the throttle plate. The heart of the system is the throttle-motor actuator (DK), located on each bank of the V-12 engine. The motor uses bi-directional current flow to open and close the throttle, according to various inputs received by the EML computer. Synchronization of both DK valves is carried out by the EML computer at idle. Based upon injector opening time (ti), the DK valves are positioned to have no more than 1.7° difference in throttle angles. The idle motor and harness connector terminals are gold plated. To open the throttle, power is supplied to one side of the DK motor (Channel B), while a 1 msec pulse to ground reaches the other side of the DK motor (Channel A). This forward current pulse works against the spring pressure in the DK motor. To close the throttle valve, the direction of current flow is reversed. Channel B is then supplied with a pull to ground pulse, while Channel A becomes the supply voltage to the DK motor. The reverse current flow works with spring closing pressure. The pedal-position sensor (PWG) is located above the brake pedal, near the steering linkage, and is connected through a linkage to the accelerator pedal. There's no direct connection between the accelerator pedal and the throttle plates, so a pair of dual-return springs inside the PWG sensor mimic the "feel" of a mechanical throttle-actuator. The EML unit monitors the accelerator pedal position via an internal potentiometer, a 9° switch and a safety switch wired to the brake switch.I have tested the position of the 9° switch by plot ting it versus the PWG potentiometer. Most throttles travel approximately 90° from a closed to open position, so I used an "if, then" statement to test for accuracy. If a throttle travels 90° in 400 msec, then 9° of throttle movement takes 40 msec. By using the PWG potentiometer readings in the guide, I was able to show the range of pedal travel as related to throttle travel and their relationship to the 9° switch. Formula: 90°=400 msec as 9° = 40 msec. The PWG sensor is really three sensors in one. The PWG potentiometer and the 9° switch give constant feedback of accelerator pedal travel to the EML unit. The EML unit provides a low voltage signal to DME units whenever the PWG voltage is low and the 9° switch is inactive. As an additional safety feature, the idle contact circuit is wired through the brake pedal switch. This is to ensure a hard to the DME units for fuel cutoff actuation, thus limiting engine speed. The brake-activation switch contains two switches in one housing, and is located near the PWG sensor underneath the dash. The EML monitors a switch that activates the brake lights when the pedal is depressed. The other switch works in conjunction with the released PWG pedal switch to provide an additional brake-pedal depressed/idle-contact input to the EML/DME control units. The voltage on the brake light input switch goes "high" while the brake pedal depressed voltage goes "low." The waveform above is the injector "on time" (ti) from one bank of injectors controlled by the DME unit. The EML unit is wired to the injector output stage from one bank of each of the DME units. By looking at the actual ti "on time" from each DME unit, the EML can reposition the throttle plates individually to achieve a balance between both sides of the" V-12 engine. The V-12 is treated like two separate 6 cylinder engines, each having its own DME control unit. It's a natural connection for the EML unit to also be responsible for cruise control. The EML helps eliminate the separate linkage or control unit found on non-fly-by-wire systems. The cruise control switch (FGR) is a two-wire, five-position control switch. The switch contains various resistor values for each position selected on the switch. The FGR is supplied with 5 volts and the EML unit recognizes the voltage drop across the selected resistor as a separate input function. engine temperature. One of the criteria for achieving throttle-valve synchronization is a coolant temperature that is 80° C or greater. The other function of the coolant sensor is to provide increased throttle response with colder engine temperatures. Always pull fault codes from the EML or DME computer(s) before starting on any driveability complaint. The AST 5510 provides fault-code access to both DME units, as well as the EML unit. The EML provides throttle-position information to the DME units. A fault code in the DME units for idle- or full-load contact could be traced back to the EML unit. A defective DK potentiometer angle or inoperative DK switch would be the root cause for a idle or full-load fault in all three units. The EML performs a self check when the ignition switch is first turned ON. The EML warning light illuminates for two seconds as a bulb check. If certain hard faults are detected, the EML warning lamp will stay on with a fault code stored in memory. Substituted values are provided for engine temperature, engine speed, and vehicle speed. Vehicle speed from the instrument cluster is sent to the EML unit. This signal is used for cruise control, vehicle-speed limiting, and idle-speed regulation. The ECU compartment box (e-box) is located behind the right-front shock tower. The EML unit uses a 55-pin connector similar to those found on DME 1.1 through 1.3 systems. Also located inside the e-box are both DME units, EGS unit and ABS/ASC control unit. This 1991 850i used an 88-pin connector on each DME control unit. A break out box was used to check the various signals going in and out of the EML unit (a JGM Automotive Tooling breakout box is shown here). The EML unit sends and receives signals to and from various control units, as it controls engine speed as related to overall vehicle stability. No matter how strong the engine is, you won't be able to do any smoky burn-outs by flooring the accelerator pedal. The EML unit determines the proper throttle opening to keep engine torque within acceptable levels. The ABS/ASC systems also send requests for torque reduction to the EML unit during cornering and braking to maintain vehicle stability. The above signal (DKE) is from the ABS/ASC control unit to the EML unit on the same 1991 850L It is a pulse width modulated signal from the ABS/ASC, requesting the EML to increase throttle angle (DKE). This signal was taken with the key ON, engine OFF, and is a 100HZ fixed frequency signal with a variable duty cycle. The DKE and DKR sensors both send fixed frequency variable duty cycle control signals to the EML unit from the ABS/ASC control unit. Der 750 stand jetzt ca 6 Jahre und hat zwischendurch einiges an Dichtungen neu bekommen, bis ich jetzt endlich den Motor vollständig zusammen gebaut habe. Jetzt springt er leider nicht mehr an. Habe festgestellt das die Drosselklappen nur bei Zündungsstart einmal kurz anrucken und danach beim starten keine Bewegung machen. Öffne ich beide Klappen per Hand, springt er an aber läuft natürlich sehr unruhig. Woran könnte das liegen? Der Auspuff inkl Lambda sind noch demontiert. 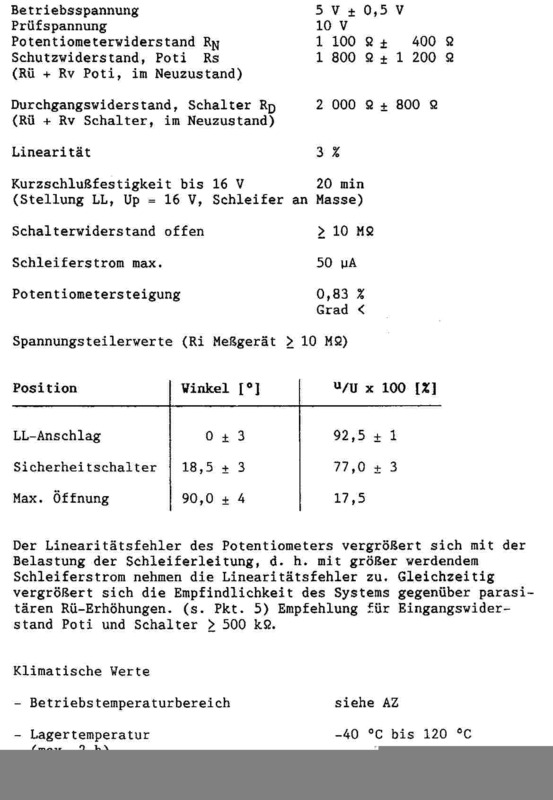 ich habe ein kleines Problem, M70 mit EML startet nicht. Es kommt im KI die EML geht an, aus nach 2 Sekunden und kommt dann wieder. Die DK sind beide getauscht und reagieren auch bei Zündung an.Wenn ich die DK manuell öffne und offen halte läuft der Motor, aber von selber macht er das nicht. Woran liegt das, alle Sicherungen und Relais sind geprüft auch die Schmelzsicherungen im Kofferraum. Natürlich hab ich die Möglichkeit zum Fehlerauslesen und es stand die DK Zylinder 7-12 im Fehlerspeicher und deshalb hab ich beide getauscht. ASC/ABS leuchten ebenfalls und gehen nicht aus! Er dreht, beide Batterien sind voll plus 1700w Ladegerät 100A ist angeschlossen an den Polen im Motorraum. Wenn ich beide oder auch nur eine DK von Hand offen halte läuft er. Eine DK dann läuft nur 1 Bank, beide DK , dann beide Bänke, aber nur so lang wie ich die manuell offen halte. Haste ein anderes EML da zum Testen? Wir hatten im E31-Forum so einen Fall. Ist er denn gelaufen bevor du die DK´s getauscht hast. Die Symptome sind die gleichen, also das Problem ist das gleiche geblieben. Ich hatte mich um die Elektrik als erstes gekümmert, Kabelbaum, Zündkerzen inkl, Zündkabel und Verteiler, DK-getauscht, alle Relais, Benzinpumpe, Schmelzsicherungen, leider hat sich die Mühe noch nicht ausgezahlt, oder er fordert jetzt die Aufmerksamkeit ein, von den Jahren wo er gestanden ist, dann soll es so sein. Ich hätte ein EML da mit dem Chip von Erich zum Testen. Habe es vorhin in meinem 750i eingebaut und er springt Problemlos an und läuft. Das Steuergerät geht am Montag auf die Reise zu dir. Vielleicht ein Tip, aber ich hatte das mal: schau mal bitte, ob auch beide DK-Stecker sauber sind in den Kontakten und richtig sitzen und verriegelt sind. es ist vollbracht, DANKE für die EML, der Motor läuft wieder so wie es sich gehört.An alle ein recht herzliches DANKESCHÖN für die Unterstützung. Die ABS/ASC Lampen sind jetzt auch aus. received the EML module + the car is starting + running now + driving = hab das EML Modul erhalten, Auto startet + laeuft + faehrt.